Oh geez. Alright, let's see what we can do here! 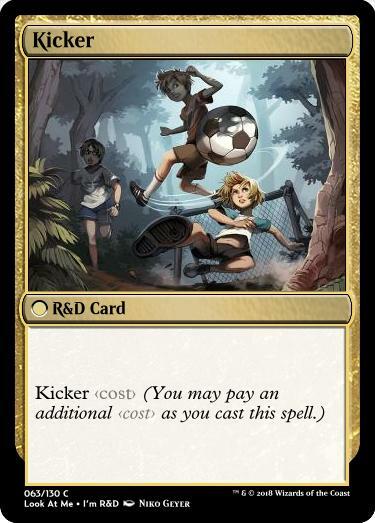 When you cast CARDNAME, each opponent sacrifices an artifact. 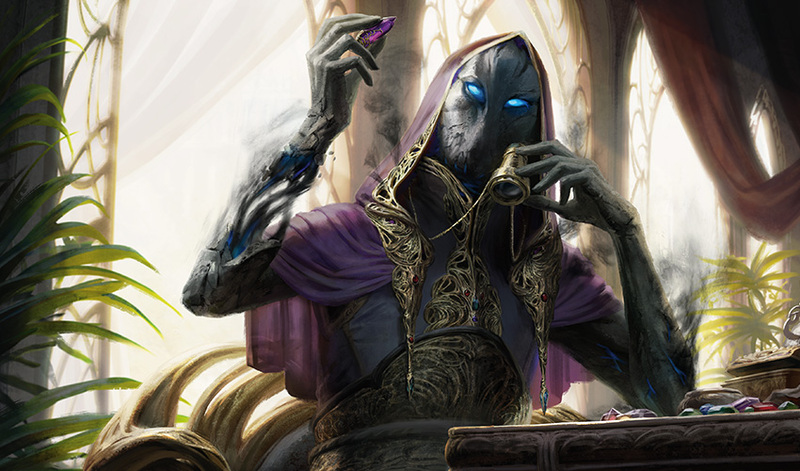 They repeat this process for creature, land, enchantment and planeswalker. 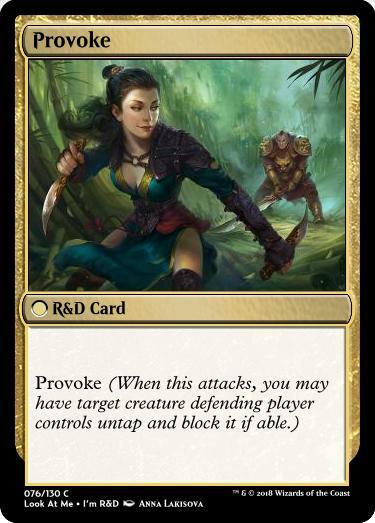 Sacrifice two permanents: CARDNAME gains protection from the color of your choice until end of turn, then you gain 4 life. This is crazy, yes -- but probably not overly so. While my absence for the past two weeks didn't help much, I'm nearly done adding all images. EDIT: In case you're interested, I've decided to upload the renders I have so far. 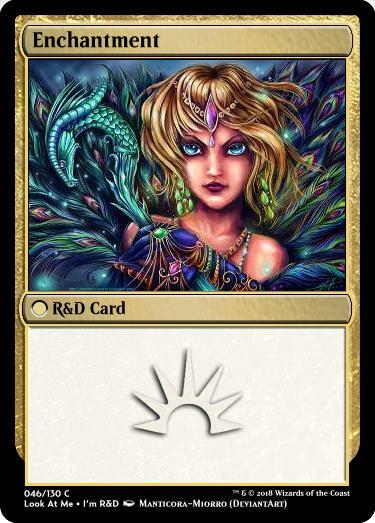 So here are the R&D Cards as well as the Idea Cards. Enjoy! Big thanks for the heads-up Fixed the render. Also added two gallery links above. 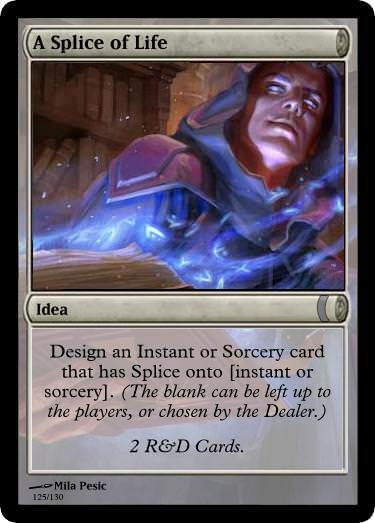 Fleur de Violet - As the dealer, you can choose for the Splice to be either Instant or Sorcery, or you can have us choose either one. Just letting you know that you have that power during this challenge. Threshold — If seven or more cards are in your graveyard create a 3/3 green Beast creature token. The woods run deep and dark; full of terrors beyond your imagination. Search your lirbary for a basic land card, reveal it and put it into your hand. Then shuffle your library. 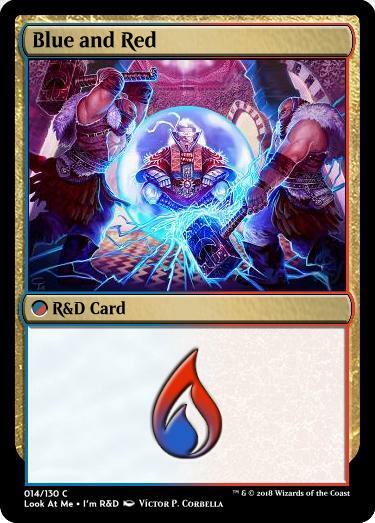 Hellbent — If you have no cards in hand, instead search your library for two basic land cards and put them onto the battlefield tapped, then shuffle your library. I hope this works - tryna get rid of "banding" before I get stuck with it in a bad situation. 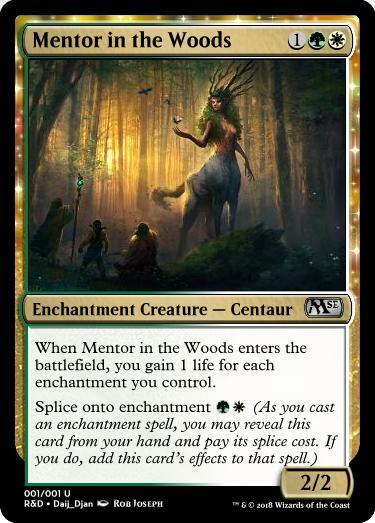 Legendary creatures you control gain "bands with other legendary creatures" until end of turn. 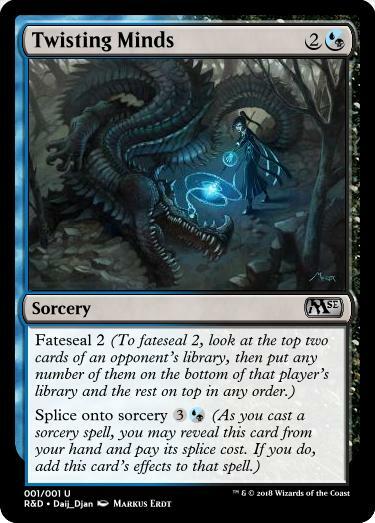 EDIT: Sadly Splicing onto enchantments doesn't fit the challenge, so I had to redo my entry. 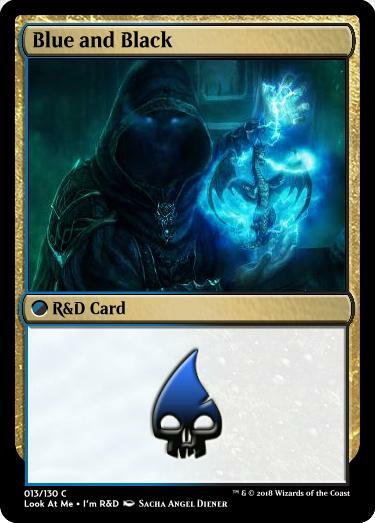 I kept the two newly rolled R&D Cards and only swapped the Blue/Black and the Enchantment ones. I'm curious to see what you will eventually use it for since it's inevitable. 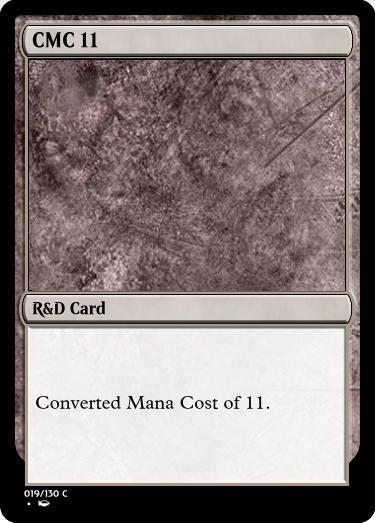 Remember you could use that for a card that isn't necessarily CMC 16; it could be like how Phyrexian Dreadnought cares about total power or how Crew works but using CMC instead. 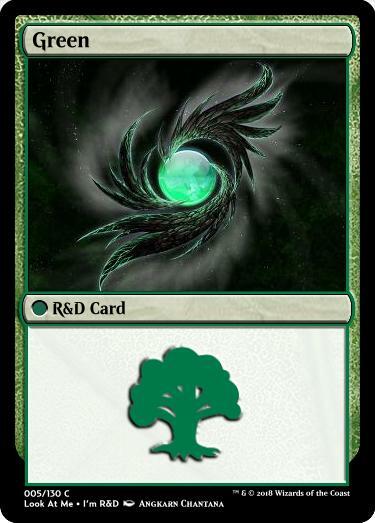 Or, you could follow what the only CMC 16 card does. 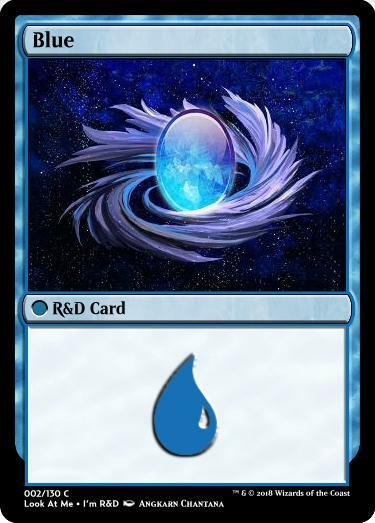 And this is made as a reminder to everyone, because this still holds true for all the R&D cards. I'm throwing a long-overdue judging out. Flo00 wins, with Xenagos as runner up. @Fleur de Violet: Big thanks for the feedback. To be honest, I was scared of my design as well even though I think the cost is high enough to keep it in check.. 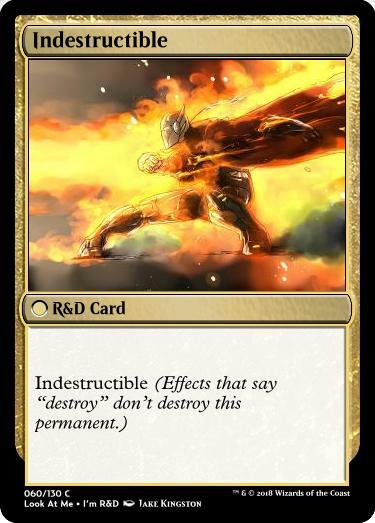 It's rather wordy for a common, but I think it's borderline ok considering 90% of its text basically never matters after it has entered the battlefield (and the effect is pretty clean and simple earlier). So this leaves me with..
Now that's an interesting combination of mechanics.. 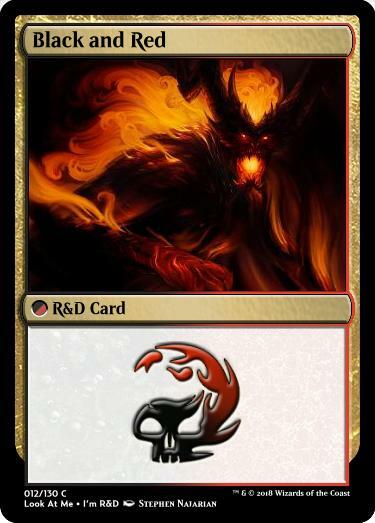 Create two 1/1 black and red Devil creature token with Provoke. Hellbent — If you have no cards in hand, those tokens gain haste until end of turn. They'll drag you to the party whether you want to be invited or not. 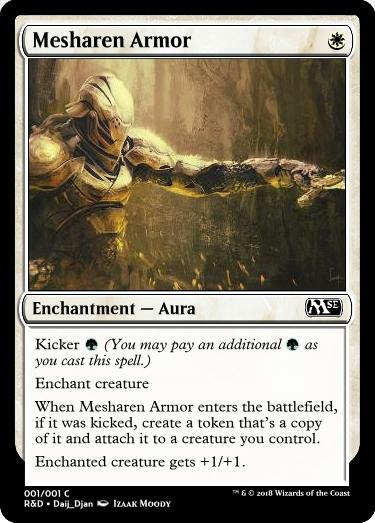 Whenever enchanted creature deals combat damage to a player, create a 1/1 white and red Human Soldier creature token. In the face of the divine, the mighty becomes the mundane in an attempt to prove one's devotion. 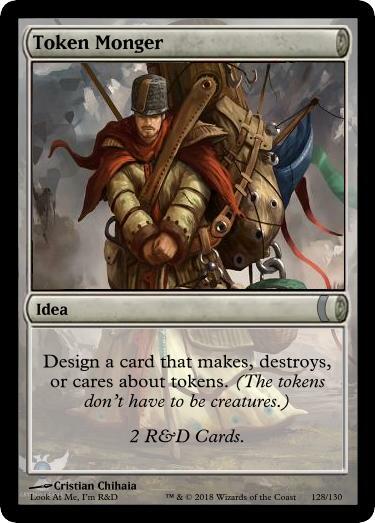 : Create a 1/1 red and white Soldier creature token with First Strike and Haste. , : All Soldiers you control gain Provoke until end of turn. Hellbent- At the beginning of your upkeep, if you have no cards in hand, you may pay and exile a creature card from your graveyard. 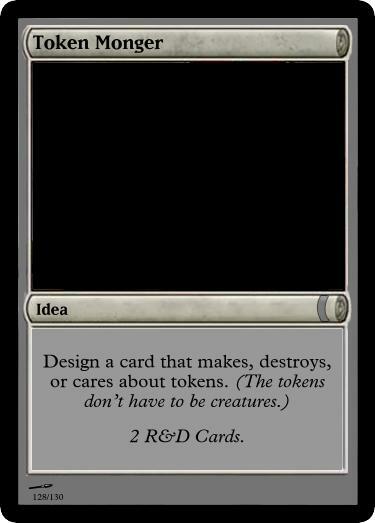 if you do, create a token that's a copy of the exiled creature except it's a 4/4 black Zombie. 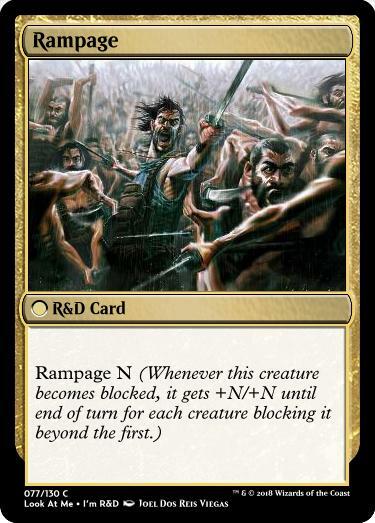 Sacrifice Servant of the Eternals: Target Zombie gains indestructible until end of turn. A loyal servant does what they must to serve their masters. I'll probably judje this tomorrow. I'm not 100% sure I'll find time for it, but the chances are good. I'm too tired right now to do a full judging. To keep this going, Fleur de Violet wins. I'll do a full judging sometime later. This game idea is sick, thanks Zuty. : ~ gains lifelink until end of turn. 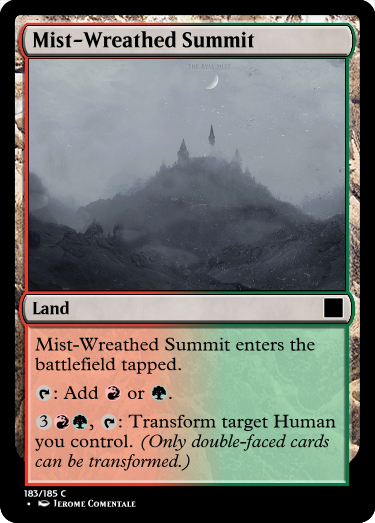 Mist-Wreathed Summit enters the battlefield tapped. 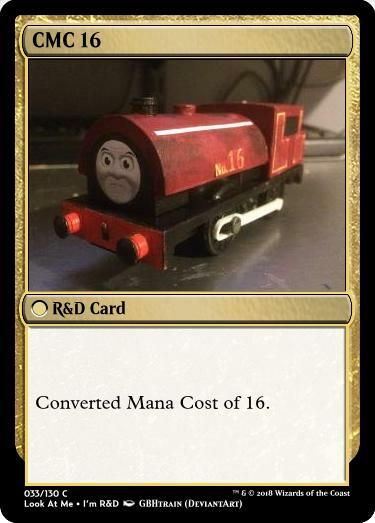 At the beginning of your upkeep, if you control a Xenagos planeswalker, transform ~. Xenagos - The additional rule for the challenge is that it needs to have a power of 3 or less (so no creatures or vehicles with 4+ power). 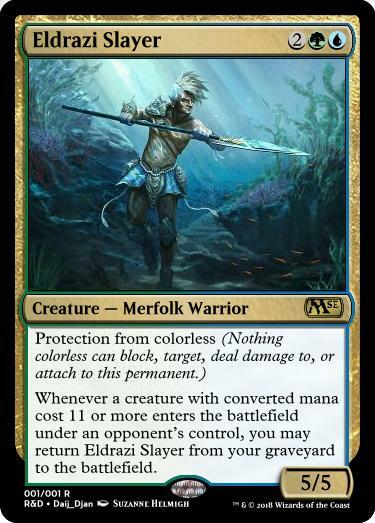 Protection from creatures with converted mana cost 9 or greater. Zuty Yes, I believe my Land falls under the category of "not a creature or vehicle with power 4+"
The rule is actually "Your card must have power 3 or less". It's in the image for the Idea card. 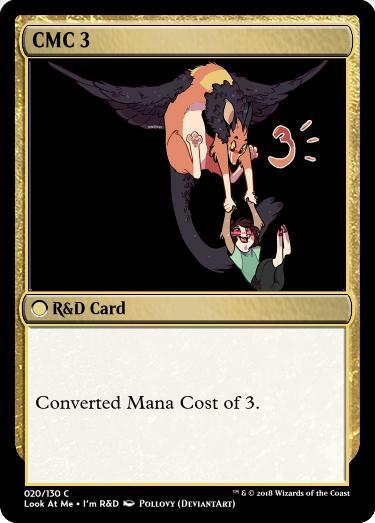 "Your card must have a power of 3 or less" If that also means that it can be a non-creature card, that would be great to know. Landfall — Whenever a land enters the battlefield under your control, Rime Bug gets +1/+1 until end of turn. If that land is snow, Rime Bug gets +3/+3 until end of turn instead. Landfall — Whenever a land enters the battlefield under your control, Glacial Vampire gets +1/+1 until end of turn. If that land is snow, Glacial Vampire gets +3/+3 until end of turn instead. 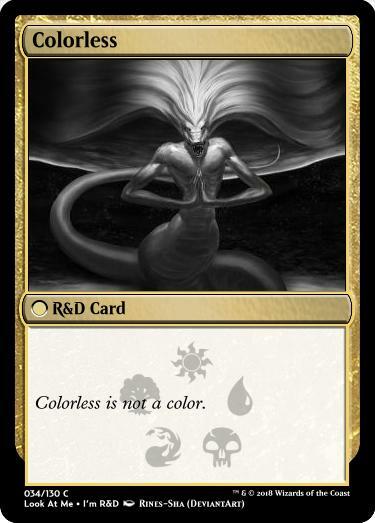 Xenagos, Zuty: Noncreature cards have a power of 0, so they're fair game. 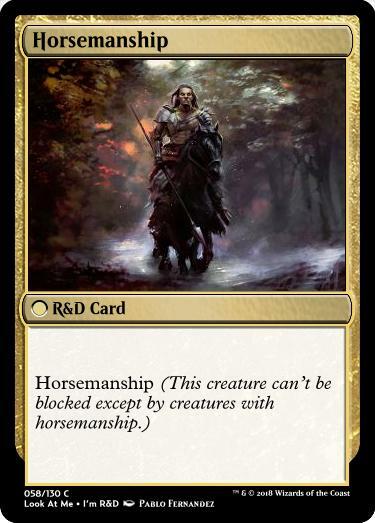 Xenagos , Zuty : Noncreature cards have a power of 0, so they're fair game. Okay, thank you for the clarification. Now that I know that I probably should change my entry, but I'm to tired.